The Awards will be presented at the Foundation’s annual breakfast at 7:00AM, Wednesday, April 26 in the Brahms Room of the Encore Hotel in Las Vegas, during the National Association of Broadcasters (NAB) Show. 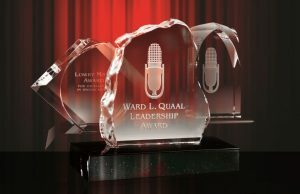 The Leadership Awards are given annually by the Broadcasters Foundation in recognition of career contributions to the broadcast industry and the community at large, and are named in honor of iconic broadcaster Ward L. Quaal. The breakfast is complimentary to all, although pre-registration is required. To register, or to obtain information on reserving a page in the Program Guide, please contact the Foundation at 212-373-8250 or info@thebfoa.org. You can also register online. This year’s event is sponsored by Frank N. Magid Associates, Marketron, the National Association of Broadcasters (NAB), the National Association of Media Brokers (NAMB), Nielsen, the Radio Advertising Bureau (RAB), and the Television Bureau of Advertising (TVB). For more than 70 years, the Broadcasters Foundation has distributed millions of dollars in aid to broadcasters who have lost their livelihood through a catastrophic event, debilitating disease or unforeseen tragedy. Personal donations can be made to the Foundation’s Guardian Fund. Corporate contributions are accepted through the Angel Initiative, and bequests can be made through the Foundation’s Legacy Society. For more information, please visit www.broadcastersfoundation.org, call 212-373-8250, or email info@thebfoa.org. The mission of the Broadcasters Foundation of America is to improve the quality of life and maintain the personal dignity of men and women in the radio and television broadcast profession who find themselves in acute need. The Foundation reaches out across the country to identify need and provide an anonymous safety net in cases of critical illness, advanced age, death of a spouse, accident and other serious misfortune. The Broadcasters Foundation of America is a 501(c)3 Public Charity.